Last week was one of those weeks. The truth is, all the stuff that happened was happening to people around me. But still, I felt it. It's not my story to tell so I can't get into it here. But I must say that I watched in awe as those around me faced some serious adversity and kept on pushing. I'm not like that. I face adversity and stop dead in my tracks for way too long. This week I want to work on that. I want to work on persevering. I want to break the mental chains that hold me in place for far too long. All of that has nothing to do with muffins of course. 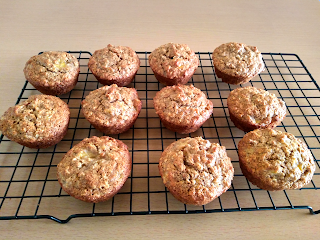 It was good to lose myself in baking muffins for a bit and not think about the world around me. I tried to get lost in some cinnamon roll baking too but ended up with the ugliest batch of cinnamon rolls ever. Ah well. They still taste good. As for these muffins, they're great! I expected to have some relatively dry muffins on my hand. 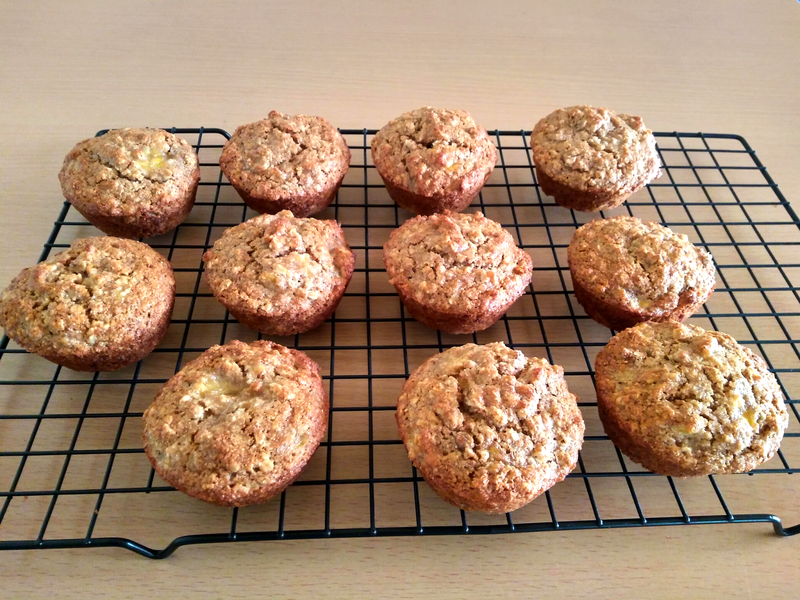 But while they're a bit drier than their white flour counterpart, it really isn't that much of a difference and I'd be happy to make these my go-to banana muffins. Extra fibre! The batch makes about 13 but you'll only see 11 in my pics. My brother grabbed some as soon as they got out the oven. The usual. 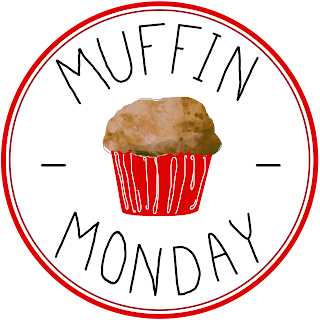 It's Muffin Monday so you know the drill. 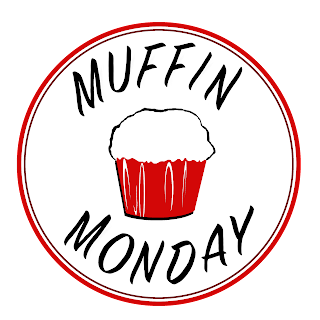 Great muffins await you below! Preheat oven to 400F. Grease a 12 cup capacity muffin pan and a small ramekin. Mix together flour, oats, baking powder, ginger, baking soda, salt, and nutmeg. In a separate bowl mix together bananas, sugar, milk, oil, egg, and almond extract. Gently stir the banana mixture into the dry ingredients. Divide among the prepared baking pans. Bake 13-16 minutes or until a toothpick inserted into a muffin comes out clean. When tofu won one of the polls for January's Crazy Ingredient Challenge, I really wanted to kick myself. I finalize these lists. How could I have put the dreaded tofu on the list? Shouldn't I be rigging these things to suit my preferences. 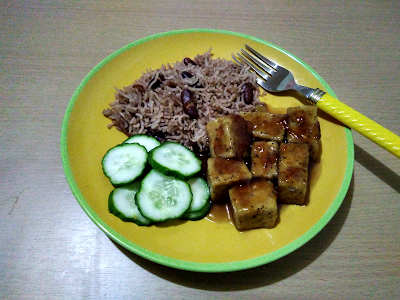 Alas, I don't, so here it is: tofu and pomegranate. Just in case it isn't clear, I do not like tofu. At all. I'm not going to tell you that I tasted this dish and the clouds parted and the sun shone bright and I licked my plate clean. Nope. It's still tofu. The sauce is delicious and I can't wait to try it with some chicken. But the sauce was not enough to get me to like tofu. My issue with tofu is mainly the texture. There's an underlying flavour that I don't quite like but I can handle that. I'd have to process the tofu into little tiny bits and hide it in a bunch of stuff in order to not dislike it. I'm looking forward to seeing what my fellow CIC members did with their tofu because I have some tofu left and I don't want to throw it out. And unfortunately, we are all anti-tofu around here. Maybe someone processed it to smithereens just for me? Let's scroll down to see! Remove tofu from packaging, wrap in paper towels and place a heavy object on top of the tofu. The object is to remove as much of the water as possible. I left mine for longer than a night but I think it takes less time than that. After the tofu is drained and pressed, slice into cubes and season generously with salt and pepper. When you're ready to cook, toss the tofu in some cornstarch and set aside. Dissolve the 1 1/2 tablespoons of cornstarch in two tablespoons of pomegranate juice and set aside. Simmer the pomegranate juice, sugar, soy sauce, ginger, garlic, salt, and cayenne over low heat for about 20 minutes. Stir in the cornstarch slurry and let the mixture thicken to desired consistency. Remove from heat. Shallow fry tofu cubes until golden and crispy. Toss in sauce and serve. I tried a version of this with honey and no cornstarch. It was stickier and I did prefer that consistency. However, I hadn't gotten the flavour quite right so I decided to stick with this sauce. Bread baking never ceases to amaze me. 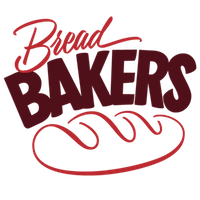 You take the same ingredients, manipulate them a little differently, and then you are left with a wide variety of bread that look and taste different. I'm ready to admit that I prefer baking bread to baking cakes. It's just that I prefer eating cakes so I'll always need to cream some butter and sugar. 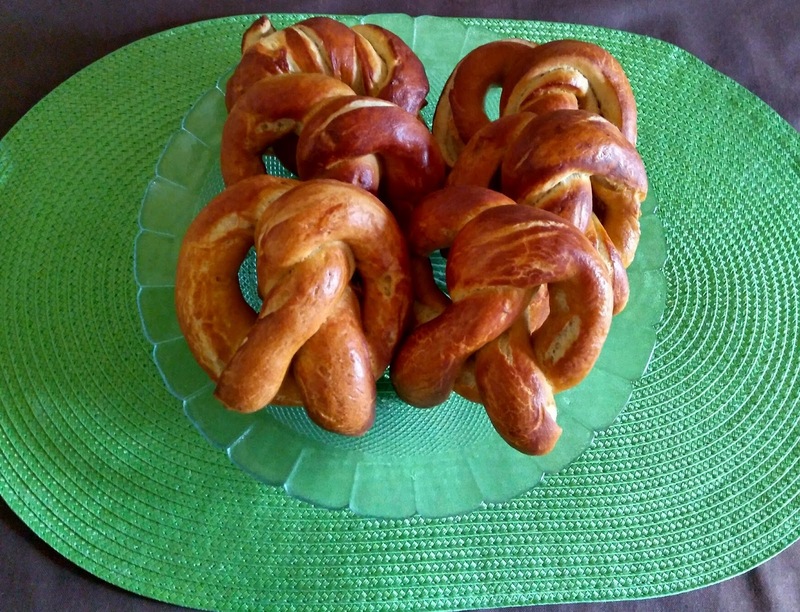 For this month's Bread Bakers, we're taking flour, yeast, and water (ahem, beer) and turning them into pretzels. There's some butter in there too because I wanted soft pretzels. But Alton Brown (from whom I adapted this recipe) said if you left the butter out, added more beer/water to compensate, and baked a little longer, you'd have some great hard pretzels. See what I'm talking about? Easy manipulation; different product. 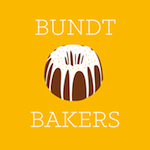 Lots of pretzel recipes below so keep on scrolling. Thanks to our host, Stacy! Mix together flour, sugar, salt, and yeast then add melted butter and beer. Knead about 6 minutes until dough is smooth and pulls away from the side of the bowl. Place dough in an oiled and covered bowl. Let rise at room temperature until doubled. Line baking sheets with GREASED parchment paper. Bring the water and baking soda to a boil. Divide dough into 12 equal portions (approximately 3 ounces each). Roll each portion into a 24 inch rope. Shape the rope into a U, twist twice and then bend over to form a pretzel. Dip each pretzel into the boiling baking soda solution for about 30 seconds. Drain then place on baking sheet. Mix the egg yolk and half tablespoon of water. Brush over each pretzel. Bake 12-15 minutes or until pretzels are dark, golden brown. Hide them from your family so that you can eat them all. The pretzels will stick if the parchment isn't greased well. Also, drain well before placing on parchment. The original recipe used 2/3 cup baking soda but some commenters said this made it bitter. You're welcome to try with the full amount. I used Red Stripe Beer. We take turns hosting each month and choosing the theme.